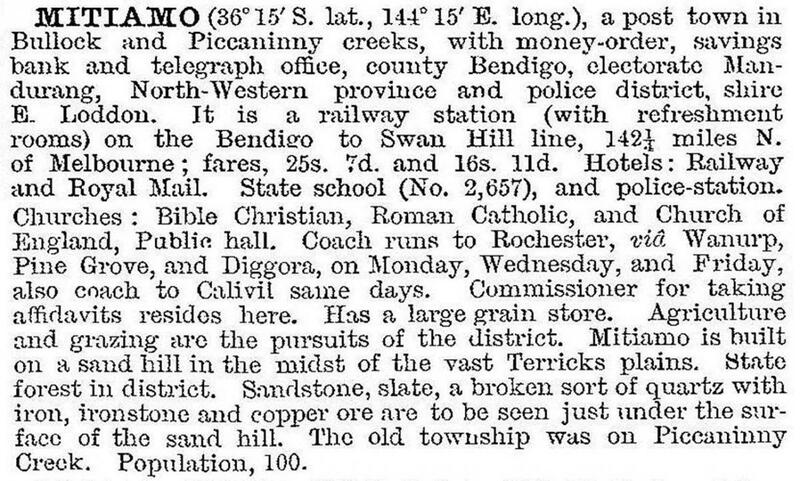 Mitiamo is a rural village on the railway line from Bendigo to Pyramid Hill, and the nearest natural feature to it is Mount Terrick Terrick (197 metres above sea level). Mitiamo was first a parish name, thought to have been derived from an Aboriginal word referring to a man behind me. The Mitiamo township was surveyed in 1874, when some of the district was subdivided for farm selections. The district is flat and subject to dry spells, but Mitiamo is situated between Bullock Creek (3 km west) and Bendigo Creek (3 km east). Mitiamo was a large grain shipment centre, and additional silos were built in 1941-42. The silos are the most prominent features when Mitiamo is viewed from the summit of the Terrick Terrick reserve, 5 km northwards. Mitiamo also has a golf course, Anglican and Uniting churches, a hall, a recreation reserve, a store and a hotel. The school closed in 1993, outlasting most others in the district which closed when a consolidated school was opened in Dingee in 1951.